How to apply online Refund Form? R.M. Lodha Committee is that committee which was formed by SEBI to look into the matter of Subrata Bhattacharya vs SEBI and in other related matters following the directions of the Hon’ble Supreme Court of India. The Lodha Committee was appointed the Chairmanship of the former Chief Justice of India, Hon’ble Justice R.M. Lodha. The Committee announced to sell and dispose off all the properties of PACL to begin with the refunds process. As promised, SEBI India has refunded more than 1 lakh investors whose claiming amount was upto Rs. 2500 and now SEBI has invited claim applications from claimants who invested more than Rs. 2500 in PACL properties. SEBI has released all the details regarding the PACL properties seized. Around 29,000 such properties, 13,863 additional properties have been seized and sale proceeds are underway. This clearly implies SEBI now has that much amount to pay back refunds to all the investors. In this matter, the second round of refunds has begun and claimants can file their refund claims till April 30th, 2019. Some people believe that this is clearly being done to win some votes as Lok Sabha elections are due in the month of May. That might be the case, but right now we should only focus on the ongoing refunds process so that not even a single update on PACL refunds is missed. How to apply SEBI PACL for refund claim application online? PACL refund claimants with total invested amount upto Rs. 2500 were refunded, hence concluding the first round of refunds and now claim applications are invited by SEBI India from investors with claiming amount of more than Rs.2500. Investors seeking refunds must send their claim applications to www.sebipaclrefund.co.in by uploading all the details and scanned copies of PACL policies. The refund form applications must reach the panel by April 30, 2019. A free demo video is available on the website of SEBI so that the PACL investors can see how to apply for PACL refund application form. For further queries you can call toll to free number 02261216966, given by SEBI. If you have lost your mobile number or , if you have lost your pacl certificate you can call them. 10. Bank Statement showing the last three transactions. 1. Claimants need to have these documents to submit their application – PACL Certificate or receipt, PAN Card, any cancelled cheque or Bank verification letter and a photograph. 2. The claim application link mentioned above will take you the home page shown below. Click on the ‘Registration’ button present on the right hand side. 3. The Registration form will open up where you will have to fill in all the required fields such as ‘PACL registration number’, ‘Captcha Code’ and ‘Mobile number’. Click on ‘Generate OTP’. 4. Enter the OTP received on your registered mobile number. You can also re – generate an OTP if you entered a wrong one by mistake. 5. After entering OTP number, you will have to enter a password of your choice and then confirm it by re – entering it. Click on the tick box given against ‘I agree with terms and conditions’ and hit the ‘Register’ button. 6. On successful registration, you can now login to submit your claim. 7. The login page will appear asking for ‘PACL registration number’, ‘Password’ and ‘Captcha Code’. Then, click on login. 8. After logging in, the following page will appear. Fill in your personal details, bank details, document details and PACL certificate and receipt details. 9. The Step 1 of login page with personal details looks like this. Click on ‘Save & Next’ button to move to the next step. 10. Step 2 in the login page with beneficiary bank account details looks like this. Click on ‘Save & Next’ to proceed further. 11. Step 3 includes the document details page where you need upload a scanned photograph, a copy of PAN card and a cancelled cheque or a banker’s verification letter. 12. The last step of the login page will ask you to enter the PACL certificate and receipt details. 13. After entering all the required details, click on ‘Preview & Submit’ and you will see your detailed claim application form. 14. Check all your entered details in this preview page and if you wish to change any information click on cancel to edit the wrong information or else click on ‘I agree’ box and then hit the ‘Final Submit’ button. 15. When your claim application form is submitted, you will get the following confirmation message with an acknowledgement number. A SMS regarding the same will also be sent to your mobile. 16. Click on OK and the login page will appear. 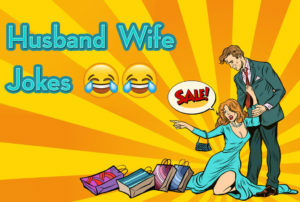 Enter you registration number, password and captcha code and press login button. You will see your Reference or Acknowledgement Number on the personal details page. 17. To clear out any doubts, please refer to the FAQ section available on SEBI’s website before filing for a claim application. Q. How to apply for SEBI PACL online refund form registration? 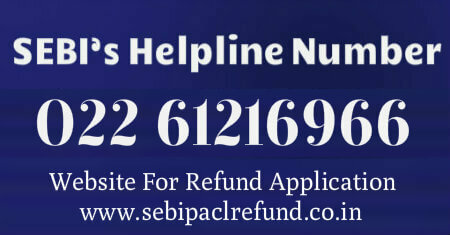 Ans – To register for PACL online refund process, login to www.sebipaclrefund.co.in. PACL refund registration form will open up where you need to fill all the required details such as your PACL registration number, registered mobile number and Captcha Code. After entering the details, an OTP will be sent to your registered mobile number. Enter the OTP received to successfully register for refund claims. After this, follow the instructions that appear. Note: SEBI India has also posted a demo video on its official website about ‘How to fill PACL Refund Application Form’. 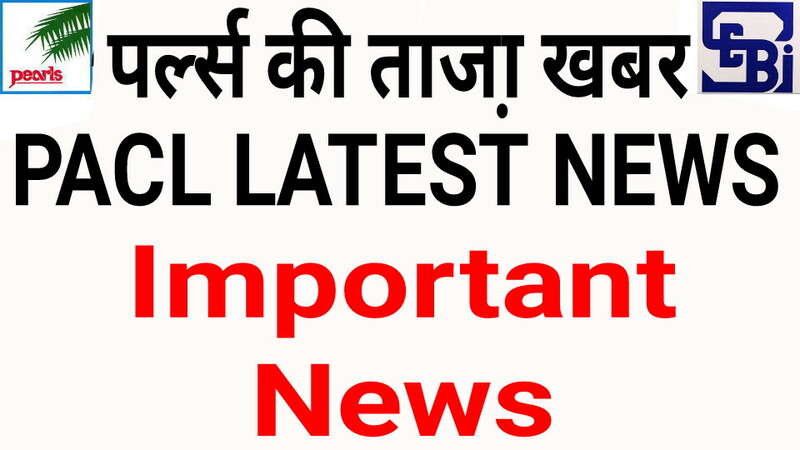 This video is available in both Hindi and English. Q. How to download PACL online refund form? Ans . The PACL refund form is available for filing refund claims on the official website of SEBI India till April 30th, 2019. This form is not available for downloading. Claimants can fill their refund application form and upload valid documents by visiting SEBI’s website. Ans. – After registration, you will see a password creation screen. You have to create a password of your choice. The password length must be 8-16 characters and it should contain at least one upper case letter (a-z), one number (0-9) and one special character(@, #, & , !). Ans. – You need to submit your name as per PACL receipt/certificate, the claim amount (in Rs. 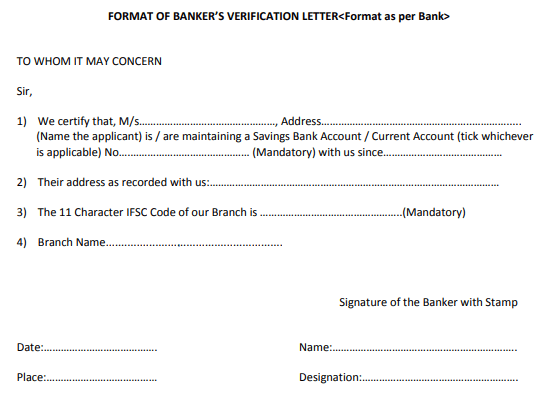 ), PAN number, your bank account number, bank name and IFSC code. Ans. – Yes, you can exit the application by clicking on the logout button. The information entered by you would be saved when you click on ‘Save and Next’ option. You can come later and log in to finish your claim application. Ans. – The documents can be uploaded in pdf, jpg or jpeg formats. Ans. – The documents uploaded should be on black and white scale, 200 dpi and vertically aligned. Ans – After completion of all the required documents that you have uploaded, you may click on the ‘Final Submit’ button, upon which a preview screen will appear for confirmation of the information entered by you on the web platform. Upon your confirmation of the information entered, the application would be successfully submitted and an acknowledgement receipt number (ARN) would be generated. This number along with the PACL registration number should be used for all future communication. Q. What if I forgot my password of PACL Refund Login ? Q My name on the PACL Certificate and on the Aadhaar and PAN Cards are different? Ans . You are to provide the name as is on the PACL Certificate along with the necessary supporting documents i.e., PAN/Aadhaar Card, Bank Statement and PACL Certificate/Receipts. Q. Can a guardian claim for PACL refund if there is an investment made in the name of a minor who does not has a PAN Card? Ans: As per the SEBI PACL refund process, a guardian can apply for refunds online only if he/she is a nominee for accepting refunds on behalf of that minor. A minor might not have a PAN card which makes the nominee eligible for applying refunds for the PACL account registered in the name of that minor. Q. If an old/aged investor has to claim PACL refunds but he/she does not have a PAN Card, then it is possible that their nominee can apply for refunds on their behalf? Ans. No, an aged investor has to have a PAN card to claim for their refunds and no nominee can claim it on their behalf. However, SEBI might release some new information regarding the aged investors without PAN card. So stay tuned for related updates. Q Have investment in the name of minor, can guardian apply for refund with their bank details? Ans . In the present process of refund,a guardian cannot apply for refund on behalf of aminor at this stage. However, the matter is being considered by the Committee and as and when a decision is taken in this regard, the same shall be notified. Q What if the PACL certificate holder has passed away? Can any nominee file for refund claim on behalf of any deceased investor? Ans . Yes! If an investor has died but the PACL bond issued on their name has the name of a nominee, then that nominee can apply for PACL refunds on the behalf of the deceased investor. Q What if I do not have a PAN card? Ans . You would need to obtain a PAN card and then submit the application. Q How do I obtain a PAN card? Q.What if the PACL Refunds website is not working? Ans .Chances are high that the PACL refunds login page/website might work at a slow pace or hang or even crash. The reason for this might be the excessive traffic on this login page as PACL claimants from all over India would be visiting the website which ultimately leads to the site getting down. Users facing such problems should wait for some time and apply for refunds later in the day when there is presumably lesser traffic on this website. Q. What to do if an investor faces trouble while filing for PACL refunds? Ans. If an investor is unable to register for refunds or they receive any message like ‘Your login details does not exists’, then those claimants can take a screenshot of that particular page and send it to sebi@sebi.gov.in with their related concern. Q. What to do if my documents are not being uploaded successfully? Ans .Unsuccessful upload of any of your documents might be the case of the supported documents being more than the prescribed upload size. Keep your documents in a smaller size format (preferably KB) for an easy upload of them. Q. If an investor has more than one bond registered with PACL with the same name, then do they need to fill separate claim applications? Ans. Yes, if an investor has three or four bonds with PACL, then they will have to fill separate claim applications for each of them. This is because every bond shall have a different number on them and investors will be refunded only for those bonds for which they have filled claim applications. Q. What if an investor has lost their PACL receipt(s)? How can such investors apply for PACL refunds? Ans. If any investor has lost their PACL receipt, then they can attach the original bond along with the first and last receipt of that particular bond. Attaching all the receipts is not necessary. Q. What claiming amount out of principal or maturity has to be filled in by an investor who has a FD registered with PACL? Ans. If an investor is seeking refunds for their FD in PACL Ltd., then they can fill in the maturity amount if the maturity date is over. If your FD is yet to reach the maturity date, then you can apply refunds only for the principal amount mentioned in the FD. Q. If an investor took a loan on their PACL policy, how can they apply for refunds? Ans. Yes, off course! Investors, who have applied for loan, let’s say an investor applied for 40% loan while purchasing a policy from PACL can file for refunds. They can claim the refunds for the principal amount invested and they shall be refunded with that amount.